It’s getting hot out there, huh? 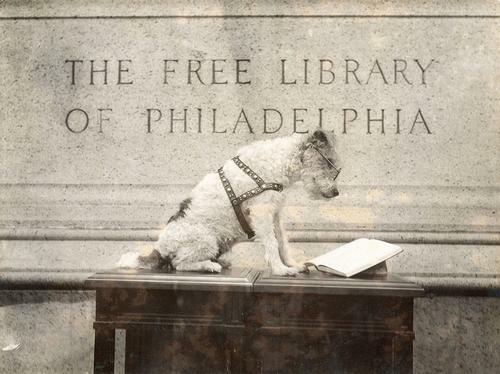 Speaking of dog days, have you ever wondered about the adorable dog in the Free Library photo? That furry friend is Knee-Hi, and we lovingly refer to him as our mascot. But upon a bit more digging by a trusty member of our Print and Picture Collection, we learned some more about Knee-Hi, whose owner was a former school principal and trained the tiny wire-haired terrier and others after him to help children learn safety rules in a fun, engaging way as the Philadelphia Evening Bulletin safety dog! Dr. George E. Brunson of Philadelphia would accompany Knee-Hi to area schools – and later, others across the country! – to demonstrate important rules such as crossing only at crosswalks, obeying traffic laws, and avoiding playing in the street. Cool, right? You can learn more about Knee-Hi here and here. As for the Free Library connection, we can only surmise he was ‘borrowed’ for a summer reading initiative in 1938, and thus, the photo! A true Free Library treasure. So, as you go about your summer, we hope you’ll keep the Free Library and adorable dogs in mind! While you’re at it, if you’ve got a pup that happens to stumble upon a good book, snap a photo and tag it #FLPDogDays – we’ll be sharing some over on our Instagram account for the rest of the summer, so keep an eye out! Dogs and books just so happen to be a few of our favorite things! What's better than dogs and books? Add a Comment to Enjoy the Dog Days of Summer with the Free Library!